The Program 206 satellite, carrying the KH-7 (Keyhole 7) camera system (codenamed Gambit-1), was the first successful high resolution space reconnaissance program. It was managed by NRO's Program A, the USAF-led segment of the National Reconnaissance Program managed from Los Angeles AFB in El Segundo, California. The satellite was a US Air Force system with long focal length cameras providing sufficiently high resolution to identify and measure the properties of targets such as missiles and aircraft, in contrast to the lower resolution CORONA system which was only able to locate such targets. Its success caused the cancellation of the troubled KH-6 Lanyard program after only three launches. 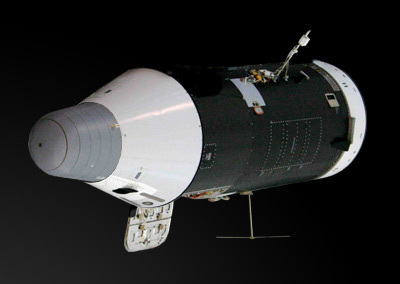 The main spacecraft was a 3-axis-stabilized satellite which separated from the Agena-D and contained the payload, camera system and reentry vehicle (SRV). It was known as the OCV (Orbital Control Vehicle). It The OCV was made by General Electric's King of Prussia plant, and the RV by GE's West Philadelphia plant. Program 206 used SRV developed for CORONA. The OCV body was a long cylinder, 1.52 meters in diameter and about 5.0 meters long, ending in a conical adapter connecting it to the SRV. The SRV was a 0.8 m long, 0.7 m diameter rounded cone with a mass of about 160 kg containing a Thiokol Star 12 retrorocket, with a mass of 33 kg full and 10 kg empty. The OCV was launched into a low altitude sun-synchronous orbit on an Atlas Agena-D rocket. The primary mirror on the KH-7 camera had a 112 cm diameter, close to the limit accomodable in the 152 cm diameter of the payload cylinder that housed it. It had a 196 cm focal length and a precission temperature control. These cameras used the strip exposure technique, pulling the film through the camera at the same speed that the camera was moving and exposing it along a thin vertical slitresulting in a long strip of film. From a normal orbit of 167 kilometer, the camera had a swath width of 22 km, with the length of the strip could be up to 741 km. It achieved a typical ground-resolution of 0.61 m to 0.91 m.
Reportedly the early flights had stabilization problems and the Agena was left attached to provide back-up attitude control. Published orbital data implies that the GAMBIT spacecraft generally operated separately from the Agena in orbit. Only on the early flights the Agena didn't separate until after SRV recovery, allowing tests of the OCV stabilization system without risking the imaging mission. The first KH-7 was destroyed in a pre-launch accident, when the Atlas booster collapsed. Thirty-eight KH-7s had been launched, with two failing to reach orbit and three others failing to return imagery. Several missions carried small "Subsatellite Ferret" satellites or other small payloads on the Agena-D stages into orbit.